On-balance volume (OBV) is a technical analysis indicator intended to relate price and volume in the stock market. OBV is based on a cumulative total volume. Volume on an up day (close higher than previous close) is added and volume on a down day is subtracted. The technique was investigated in the 1940s by Woods and Vignolia and presented in a course by them in 1946. They called it "cumulative volume". Joseph Granville gave it the name "on-balance volume" and popularized the technique in his 1963 book Granville's New Key to Stock Market Profits. It can be applied to stocks individually based upon their daily up or down close, or the market as a whole using breadth of market data, i.e. the advance/decline ratio. As stated above, OBV is calculated by adding the day's volume to a running cumulative total when the security's price closes up, and subtracts the volume when it closes down. The starting point for an OBV total, ie. the zero point, is arbitrary. Only the shape of the resulting indicator is used, not the actual level of the total. OBV is generally used to confirm price moves. The idea is that volume is higher on days where the price move is in the dominant direction, for example in a strong uptrend more volume on up days than down days. So when prices are going up, OBV should be going up too, and when prices make a new rally high, OBV should too. 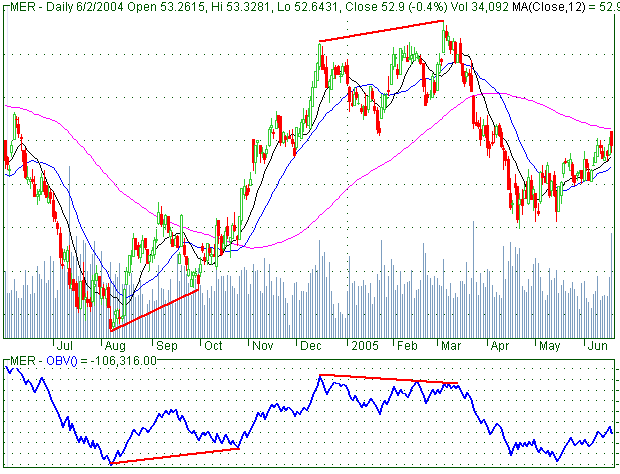 If OBV fails to go past its previous rally high then this is a negative divergence, suggesting a weak move.